Day 7: Being Vegan for A Day. "Okay, I'm doing my last project on 7x7 today. I'm going to be Vegan for a day! So exciting..."
Woke up, had lots of Facebook Chat with friends, and took my morning shower. Now, what do I have in the fridge?" ..chicken drumstick, no. Frozen meatballs, no. Cooked shrimp, no. Rice & egg, no. Oh I have eggplants! I bet it would taste good with my homemade Bolognaise I made on the weekends. Oh wait... that one has ground beef in it. So what do I eat this with, salt & pepper only? Argh this challenge is getting tough already. "Okay nevermind, let's have breakfast outside."" I ended up spending half an hour browsing what should I eat, what I cannot eat, and which vegan meal to try. I only have two meal time (lunch and dinner) so I was thinking to try one vegan restaurant near school, and another one, maybe the best one if possible. This is truly the moment to thank the internet and ALL the vegan friends you have. In my case, I only know one person. So thanks, C! "If this is gonna be my first attempt being vegan, it just has to be the BEST vegan lunch in town." 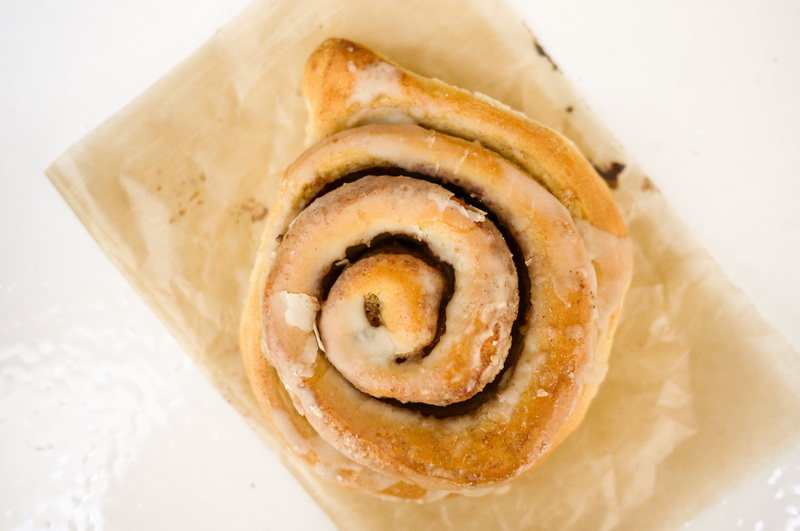 So based on previous research, I made up my mind to go on and try The Cinnamon Snail. Rated as #1 Best Place to Eat in NYC 2014 by Yelp, Best Food Truck in NYC by Gothamist, 10 Best Food Trucks in America by The Huffington Post, 2013 & 2012 Vendy Hero Award Winner & Finalist, and so on.. The Cinnamon Snail really made me curious. Being a vegan food truck, their location is mobile so I had to check their Twitter/Facebook first. Turns out, on Tuesday they parked near Wall St/Water St, right between Gouverneur Lane & Old Slip. The food truck is parked in front of the Ferry News Stand. "I traveled all the way to Wall Street only for buying vegan lunch. This better be worth it.."
"Let's order. Maple Mustard Tempeh Sandwich sounds good, but so does Lemongrass Five Spice Seitan. Or should I try the Today's Special? Lemongrass Beet Burger with Sambal Oelek, Kefir Lime Cabbage Slaw, Arugula and Red Curry Mayo on Grilled Foccacia Bread also sounds appetizing.. I bet all those toppings would taste great with US Prime ground beef patty. Wait, no! I shouldn't even thinking about that. Okay maybe I'll just ask what they'd recommend me as a first timer here." "So I ordered this one instead." This is Korean Barbeque Seitan ($9), served open faced on a grilled tortilla slathered with chili butter, kimchi and greens. Seitan is a common meat substitute for vegetarian made of wheat gluten which looks & tastes like chicken. But trust me, if you've never tried it at least once, you're missing out in your life. Everything about this dish is perfect. 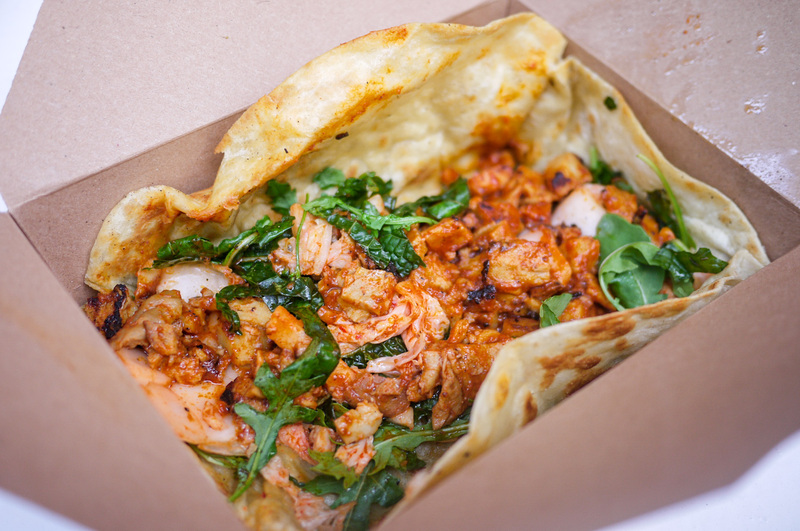 I love the fresh & crisp greens, the fragrant chili-butter slabbed on the grilled tortilla, and also their kimchi. It's a nice interplay between the right texture and various taste hitting your tastebud at the same time. Mouthgasm! 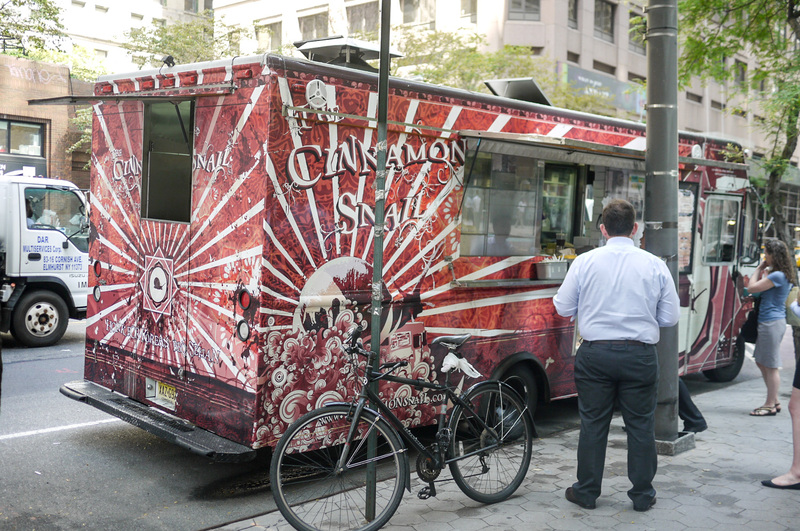 I would come back for more Cinnamon Snail. 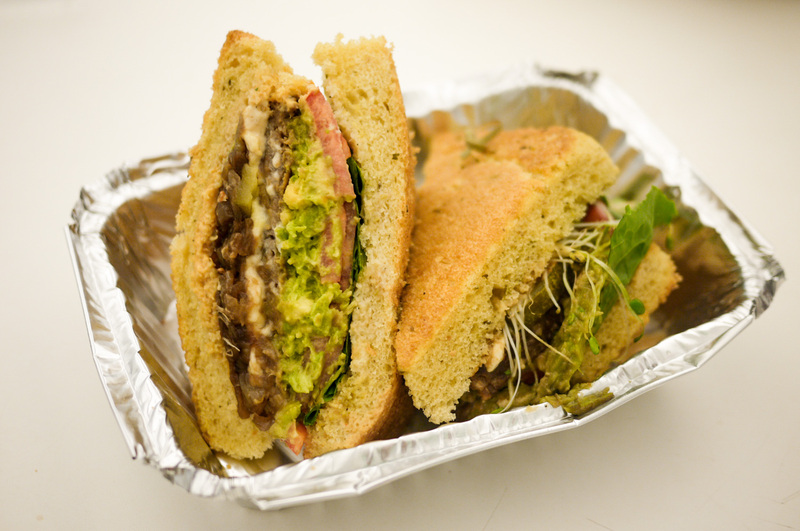 "I think I just had the BEST lunch during my 1.5 month in NYC.. And it's vegan." Went back to D12 to work on some homework. All hail the 5 Express Train! Wall St - Union Sq in 15 mins. I started making this timeline structure. Made a script of the entire journal in Excel, and then looking up for some useful JQuery timeline plugin because I won't have time to built one from scratch in less than half day. Who knew that making homework can be so exhausting? I got hungry again. Since I was having such a great time previously at The Cinnamon Snail, I packed up some snacks for my afternoon class. This is Raspberry Cheesecake Doughnut ($3). It was really delicious, not as flaky as I preferred, but not too dense too. I like the fact that the raspberry and the cream cheese filling is not too sweet. 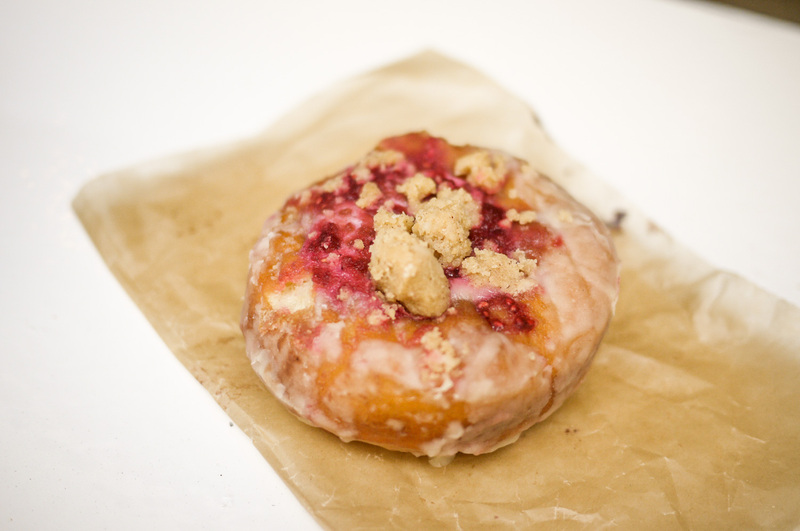 And the crumble on top adds perfect crunch to the doughnut. Lovely. I still can't believe how something that tasted this good can be labeled as "vegan"! Went to my first class of the day. It was "Collab: Future Gadgets" at 2 West 13th Street - 1111 by Deren Guler. Class Break = Another Snack Time! Cinnamon Snail bread ($3) that I bought earlier along with the Raspberry Creamcheese donut. Shared it half-and-half with a friend! Class ended a bit late. I realized I only have 20 more minutes before my next class begins so I had to run and grab my dinner. Based on a friend's recommendation, I went to this place called Peacefood Cafe in East 11th Street. Finally the long-awaited class break comes. This is Peacefood Cafe's Vegan Cheeseburger ($14.5), garden protein (soy & wheat) patty served on house made focaccia bread with daiya cheese, avocado, garden blend sprouts, jalapeno, lettuce, tomato, pickles and caramelized onions. It's quite expensive but I guess you get what you paid for. The portion is way too big for me, thus I had to share half with a friend. I like every single element of the burger except for the focaccia bread. For me it's too big, too thick and dense and it makes it hard to get a good bite of the whole burger. But the rest was spectacular. I don't even know how can there be a vegan cheese but this one was really good. Second class of the day ended. It has been a long exhausting day but I enjoy everything. I spent 20 mins hanging out with friends before going back home. "Turns out being vegan (even only for a day) is not so bad. They eat scrumptios food too!" At first I thought it was gonna be really hard, but apparently this city is a paradise for all vegans out there. For every famous meal such as pizza, burger, cakes, etc, there's always going to be a vegan version as well. It's more of a lifestyle choice, really. "Okay, time to wrap things up.."
Transferred all of the photos from my camera to laptop, basic editing touch in Lightroom, continued finishing the script and this whole timeline, and finally making a blogpost. "This marks the end of my 7x7 Project."